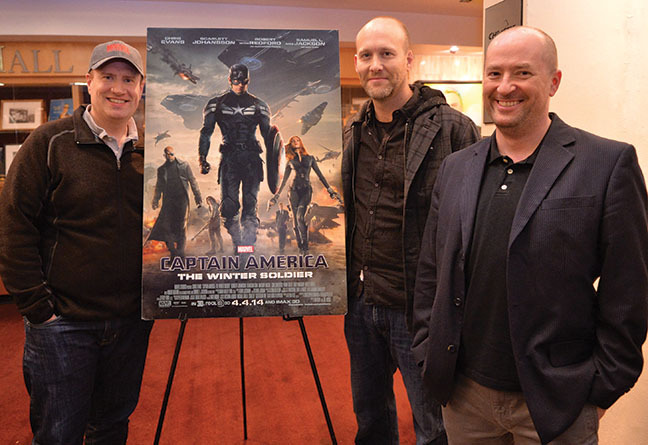 writers Stephen McFeely and Christopher Markus. Kevin Feige, President of Marvel Studios, has made a gift to his alma mater, the USC School of Cinematic Arts (SCA), to further the art and craft of creative producing. The Kevin Feige Endowed Fund for Creative Producing will help to provide support for classes on how to take projects from idea to distribution, fostering the skills needed to successfully turn a pitch into a commercial product. As the architect of the Marvel Cinematic Universe, Feige is himself a role-model creative producer. He joined the company as a producer in 2000 and was named President in 2007. He has overseen the Studio's dominance as a leading global brand over the last ten years, with the release of annual blockbusters which have all opened No. 1 at the box office and grossed over $12 billion worldwide, collectively built around franchises like The Avengers, Iron Man, and this year's summer draws: Spiderman: Homecoming, and Guardians of the Galaxy Vol. 2. Feige, who graduated from the School in 1995, is a familiar face around campus. He regularly returns to speak to students and for packed screenings of his superhero films. He is the 2014 recipient of the Mary Pickford Alumni Award, which is given to a graduate of SCA whose achievements have brought distinction to the School and the entertainment industry. SCA Dean Elizabeth Daley said Feige's gift further cements his commitment to the success of the School and its students. "I can't tell you how much this fund means to our students," said Dean Daley. "Kevin's done so much for this School and his gift will make sure that the art of creative producing, which Kevin has mastered like no other, will be taught to students in a way that honors his legacy." Feige, who has said he applied to USC to follow in the footsteps of his favorite filmmakers George Lucas, Ron Howard and Robert Zemeckis, is now one of the School's most successful alums.